I always admire other gardeners who seem to throw things together and they work out perfectly. A list, a trip to a store or two, a few hours of work, and voila! You’re ready to relax and move on to something more entertaining. My projects never, never, ever work out like that. I start something innocently enough and before you know it a budget is blown, there are walls missing from the house, or you’ve been for a visit to the emergency room. Wax on, wax off. This tabletop has seen better days. So here’s this year’s deck saga. You give it a good cleaning, plant up a few pots and warm up the grill for dinner, right? Not in my lucky world. As you get ready to pressure wash you notice the kid’s craft table is looking a bit worse for wear and really should be cleaned up before the next waterpaint session. Out comes the sander and varnish. 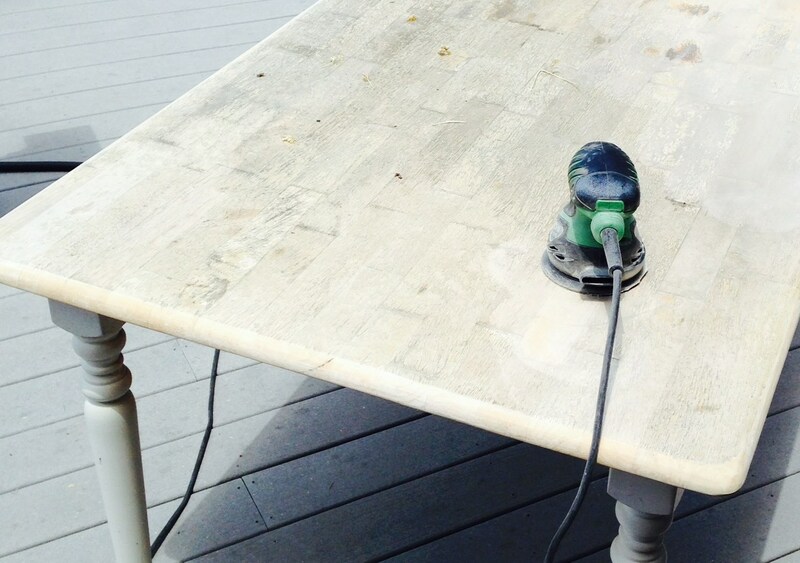 Once the table is all spiffy, the pressure washing commences. The clean looks great, but it makes you realize how abused and dirty the vinyl siding is under the covered portion of the deck. So off it comes. 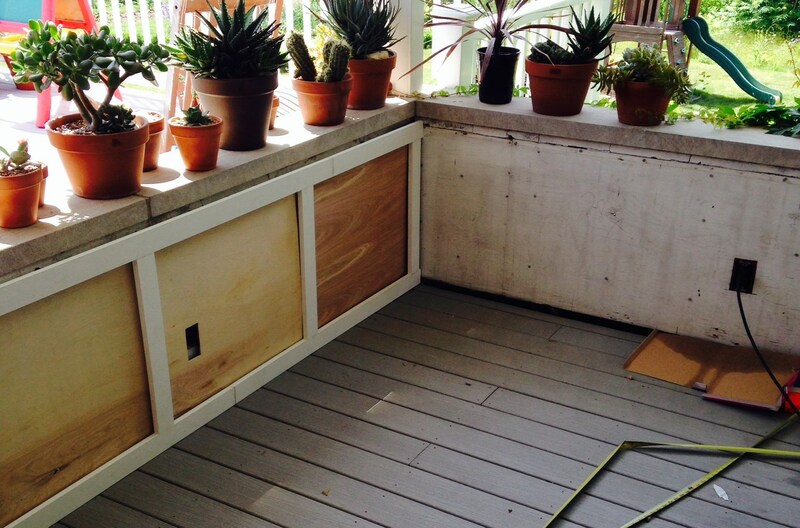 You’ve been wanting to replace it with wood paneling and now that the table is looking nice again….. 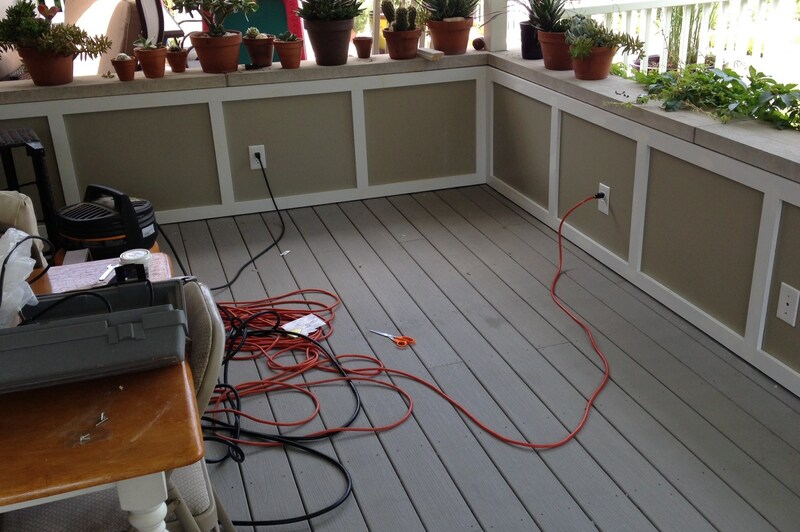 The succulents will look so much better when this is done… and the wasp nest is removed from the outlet box… and the rusted broken light fixture replaced…. The woodwork should only take a few days, but then I might as well paint the rocking chairs saved from the dumpster, and I need to plant a few of the annuals so they don’t die waiting for their deck planters. 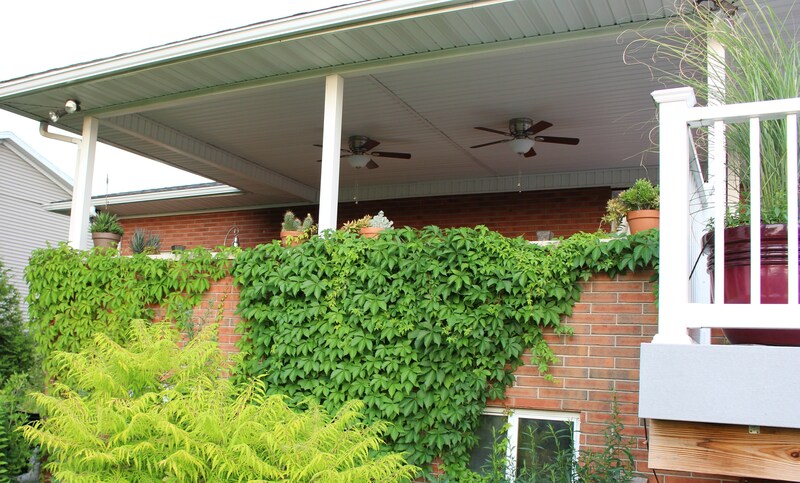 As long as you’re redoing the siding, a pair of ceiling fans sure would be nice…. A pot crowded with calibrachoa seedlings. I’ve never had reseeding with these before so I’m curious to see how they turn out… these are just four spoonfuls of seedlings out of the hundreds that came up! Not to change the subject (as if I could stay focused long enough to finish something anyway), while the renovation is going on I still need to get the annuals planted in the deck pots. Of course this is the year everything reseeded. 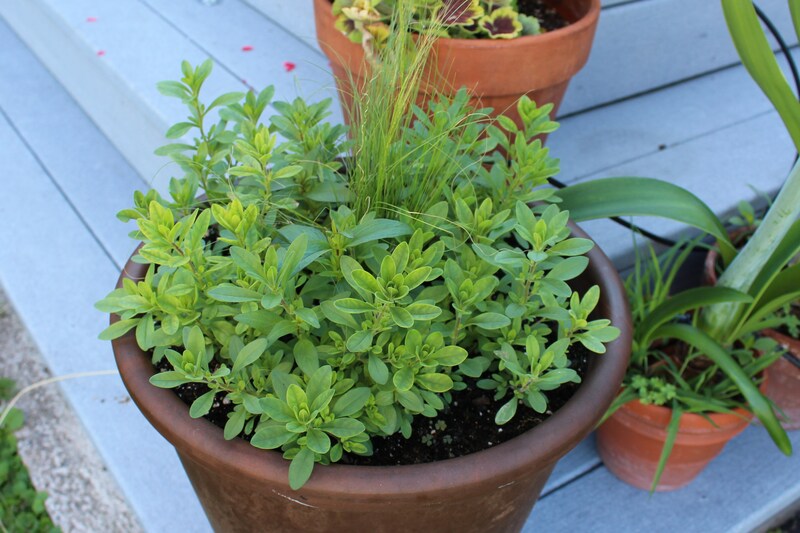 One pot is full of blue salvia seedlings, another is packed with red snapdragons, and a third has hundreds of baby calibrachoa. They all need moving off to find new homes. Once the planters are vacant (mostly) I decide I really need some tall miscanthus in the big planters. Mine hasn’t quite recovered from the winter, but a quick phone call finds a friend across town who can spare a few wedges out of his clump. So off for that. And the weeks go on. Finally the porch and deck are finished and the new plantings are filling in. 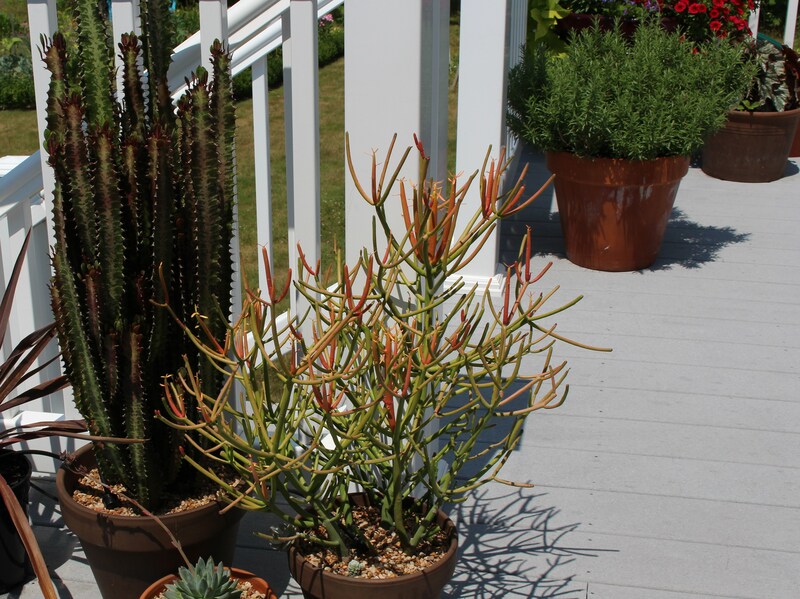 All set for fireworks viewing on the fourth of July, but all I could think about were the agaves and succulents in need of repotting. 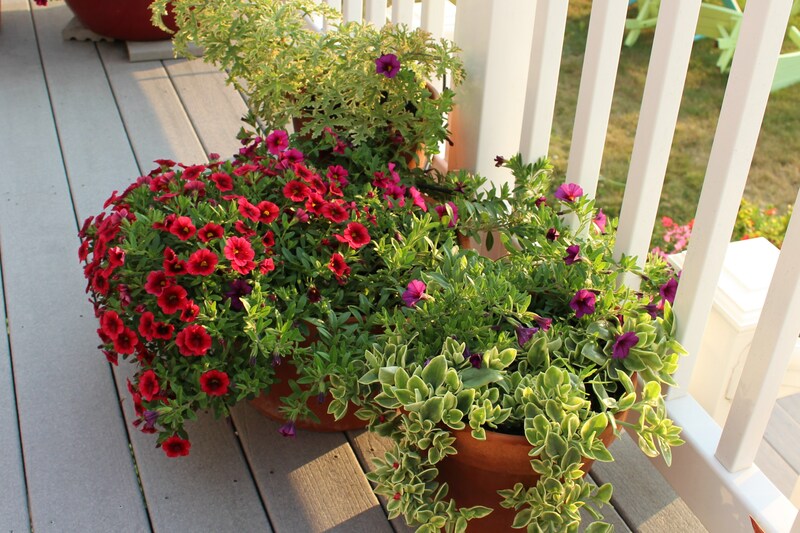 I really like calibrachoa on the deck. They bloom constantly and don’t get the little inchworms in the blooms like petunias do. These were all purchased plants, luckily by the time I got to the nursery it was so late in the season they were all marked down! Calibrachoas filling in a few of the deck pots. This year I plunked down the money for a nice mandevilla. It’s not my favorite “Alice DuPont”, but after complete failure with Alice last year, it was time for a change, and this one is filling in nicely. I suspect last year’s vine (purchased from a box store) had been chemically treated to bloom nicely in the pot. It produced blooms all summer but never grew an inch (which defeated the purpose of growing a vine), and I suspect it’s from the blooming hormone cocktail it received before it got to me. I managed to squeeze a bunch of the miscanthus into this pot, and although temperatures shot up to the 9o’s (32C) two days after its division the grass recovered nicely. All the red was kind of a surprise though. The snapdragons came in on their own (and all bloomed in reds) and the calibrachoa really clumped up, and the overall effect is growing on me. I like it even more with the chartreuse leaves of the sweet potato. Chartreuse sweet potato vine, red calibrachoa, miscanthus grass, and red snapdragons (with a little plug of blue scaveola). I’m really glad I just left the snapdragon seedlings, they took off once the pots started getting regular water and feedings, and I love the color. Now snapdragons are showing up in a second pot which was supposed to have just a single miscanthus in it. I had pulled all the extra snapdragon seedlings out of it, but with determination like that I guess I’ll have to let them stay now. Fortunately the succulent pots are more subdued. They’re calming things down a bit as well as the other survivor from last summer, the rosemary. I’m developing a little bit of a terracotta habit, I blame the cacti and succulents for it. So finally I’m done cleaning the deck. The covered part has become a nice little retreat made all the more cozy (in my opinion at least) by the Virginia creeper which has brought the garden up to the porch edges. Maybe next year I’ll work out some kind of trellising system so that the creeper can climb higher and then hang down as a sort of curtain. I like the idea, but that’s another project! The view o the porch from the garden. The creeper was never planned, but once it started growing up I welcomed it. With access from both the top and bottom it’s easy to keep an eye on it. Now I just have to decide what to do with the geraniums. All the time at the DIY store and I figured I might as well pick up a few new pots….. and then find some dark chocolate paint to tone down the orange…. 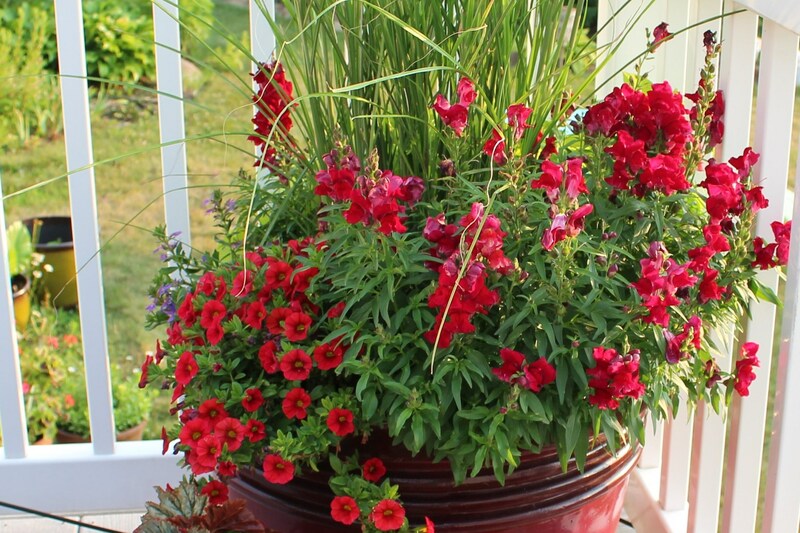 and then divide up all the overwintered geraniums (and maybe add a new one or two) to fill the pots. 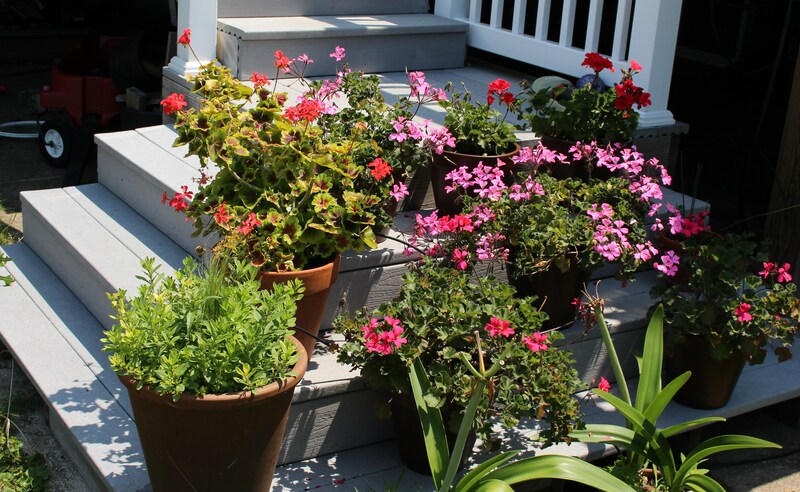 And come to think of it I should probably finish off those steps too, and the deck supports would look a lot nicer wrapped in brick…..
Why am I collecting geraniums? They overwintered a bit too well from last year and who am I to hold that against them. I hope your summer projects are coming along at a faster pace than mine do! With the way they move I tend to think nothing gets finished around here, so as the temperatures rise I might take a break and do a few recaps to see where things are going. 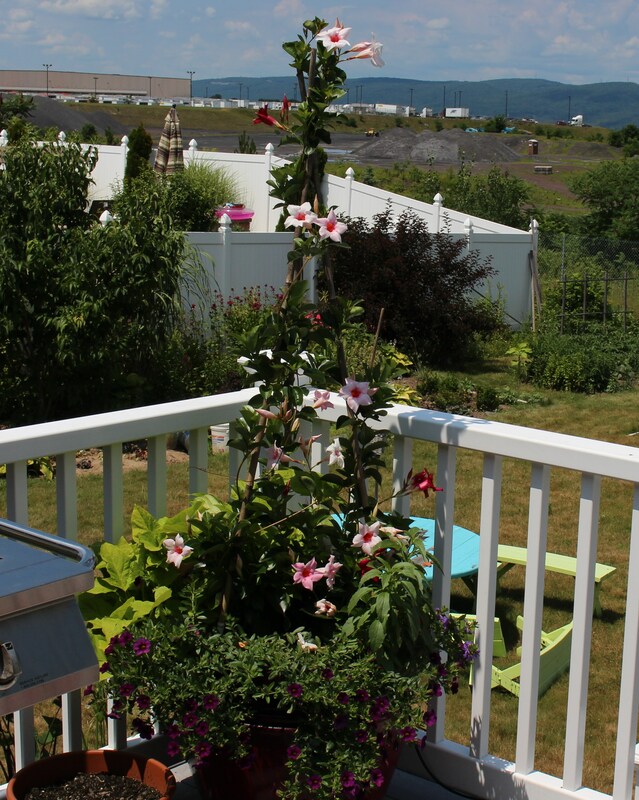 This entry was posted in annuals, deck plantings, early summer, garden stories, summer and tagged container garden, covered porch, deck plantings, home improvement, mandevilla, reseeding annuals, snapdragons. What a fantastic job you made of it all! Your decking, porch and all your pots look wonderful. I too, get sidetracked when I start on something, but it all gets done eventually. Enjoy! Phew! You make me feel exhausted just thinking about al those jobs Frank! 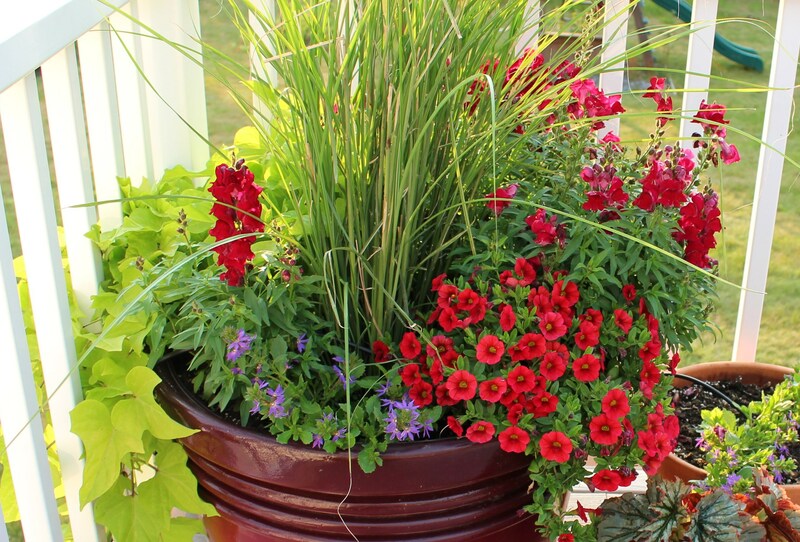 It does look really nice on your porch/deck now with all those lovely pots everywhere. I really like the red snapdragons and wish they’d seed so easily in my pots. That’s a lovely contrast with the Miscanthus. I have also invested in a new Mandevilla… full of flowers when I bought it in May, then they all dropped and it still hasn’t flowered again, so I shall give them a miss next year. I did have one I was bringing in over winter, but it got too big and didn’t start flowering until August anyway! Are you going to keep yours through the winter? Sorry to hear your mandevilla is being stubborn this year. I’m going to try and overwinter it, but they’re one of those plants that don’t do well for me inside. They want more light than I have, they aren’t happy being dormant, and they just look sad when they try too keep growing in a dim garage corner. Of course I’ll try anyway! These things come and go for me, for a few years it’s my favorite plant then for a few more I move on to other things. It’s always nice to experiment though, right? Thanks Annette! It’s always nice to hear that someone is not bored by my writing, I feel like I tend to go on sometimes! I hope things are warming up a little by now. It’s nice to have a break here and there but a whole summer of it will leave you grumbling. We are just coming in to a few nice summer days after several days of humidity. I should really see about getting a few more things done while the weather is tolerable. 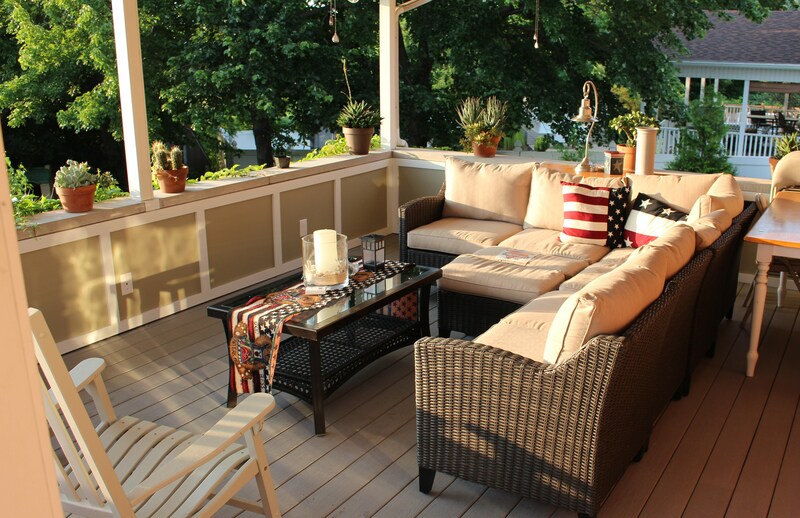 Your deck looks very inviting. Is it closed by windows or fly screens? No there are no screens or windows. We’ve thought about it but for now it stays open. What a productive summer you’ve had! The deck looks nice and I love all your geraniums. Thanks! The geraniums really are making me more happy than they should, I’m not sure what it is. Last year I laughed a little when my mother bought me the two hanging baskets (which I divided up this year). I remember growing up that her mother would do the same thing for her each spring. I guess it runs in the blood! The kids are entering that age where they can do a few things on their own and don’t need watching every second…. of course I needed to fill that time somehow! I wish more was done though, and when I think of all the plans I had in the spring it’s a little disappointing 🙂 Oh well, there’s still time! Well I am so impressed by all your efforts, I almost needed to have a lie down after reading about it. You remind me of Pooter in the wonderful book ‘ Diary of a Nobody’ . He went out and bought a tin of red paint and then decided everything in the house would look better for a coat of bright red enamel paint. Except you didn’ t buy red paint and everything does look better for your attentions. I love your pots of red colour, it all looks wonderful. Now you can sit back and enjoy it I hope. With your sense of humour, I think you would love The Diary of a Nobody by George and Weldon Grossmith. It is a comic classic. Do read it and tell me what you think. Mmm- I’ m not sure about painting things chocolate. Call it what you like, what you are talking about is brown. Everything looks great but I’m exhausted 🙂 I can so relate to one project leading to another, but when it all comes together, I hope you were able to relax and enjoy it. No lake here to enjoy, but we have been enjoying the evenings out there. On task leads to another, for sure. Love your oasis. thanks! It just keeps going on and on doesn’t it! You did a nice job all around. The space looks inviting and the containers are so colorful Great job!!!! Good luck with your over wintering plants. I did that for many years and finally just gave it up. Too much work, but the reward was always worth it. I agree overwintering plants is a lot of work. I go through phases, get carried away , and then abandon it all to the freeze just to start new again with something else. Just last week I bought an oleander. I’m sure it will be no problem to stuff it in the garage once temperatures drop…. it’s just one little plant, right? It seems to me you got a lot done. I am still working on the one glider I was going to refinish. Finally got all the old mold off with deck cleaner but it’s been two weeks and I have yet to sand it. It’s so easy to get off track. At least I try to get dressed now before stepping out. There were one too many incidences where mid afternoon I’d realize I was still wearing PJs. I love the sequencing of how one thing leads to another only slightly related chore. So much like my approach to things around our place. The outcome in your case was certainly nice though! Thanks, it’s amazing how you can run around busy all day and then realize you have yet to finish the one thing you had set out to do!